Michael Bostwick insists Posh must get stuck into their final 11 League One games like he gets stuck into a midfield challenge. The 26 year-old has been a revelation since switching to a role in the centre of the park at the request of new manager Dave Robertson. Bostwick is a quiet, under-stated man - quite the opposite of his on-field image - but he is urging his team-mates to keep their current form going until the end of the season. He accepts that Saturday’s match against fellow play-off hopefuls Doncaster is a huge game, but not necessarily any bigger than the other 10 matches between now and the beginning of May. Bostwick, who signed a new three-year Posh contract this week, said: “Every game between now and the end of the season is massive. “The rewards are in sight and it’s important that we keep our current form going. “The last three games were huge for us as we got back some belief and confidence, but we have to keep winning if we are to make the play-offs. “It’s a big game at Doncaster, but we just need to prepare for it the same as we have prepared for the last three matches. The new management team have done a great job so far and I’m pleased to be back in midfield. I love getting stuck in, making a few tackles and putting myself about. It’s what I do best. Posh signed Bostwick for a reported £800,ooo in July 2012. 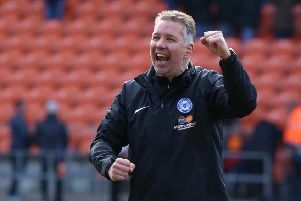 He was initially used as a goal-scoring, tough-tackling midfielder, but previous manager Darren Ferguson also used him as a central defender and a full-back. Posh coach Grant McCann, who knows a thing or two about midfield play, reckons Bostwick is the best midfielder in League One based on his recent performances. Chairman Darragh MacAnthony revealed that Bostwick ensured Dave Robertson was to remain as manager before he signed his new deal. Remaining Posh fixtures: v Doncaster (away), Preston (away), Chesterfield (home), Coventry (home), Scunthorpe (away), Walsall (home), Swindon (away), Crewe (home), Barnsley (away), Crawley (home), Oldham (away).